This is a list of United States of America states by Name as of 2014. The list was made using the 2014 Census estimates taken by the United States Census Bureau. 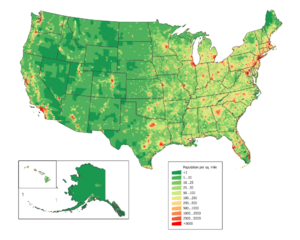 The total population of the United States was 308,745,538 at the 2010 Census, and was estimated to be 318,857,056 in July 2014. These numbers include all people other than people just visiting: These include citizens, non-citizen permanent residents and non-citizen long-term visitors. People in the military who are working in other countries and their families are counted in their home state. The United States of America is the one of the most populated countries, behind China and India. The following is the state by state population count as of the July 1, 2014 estimate. List of U.S. states by population Facts for Kids. Kiddle Encyclopedia.